When I first started my search for more "found sound collage," one of the earliest and most insistent recommendations was for a record put out by DOVentertainment, a Canadian record label which at one point was also affiliated with Ninja Tune. 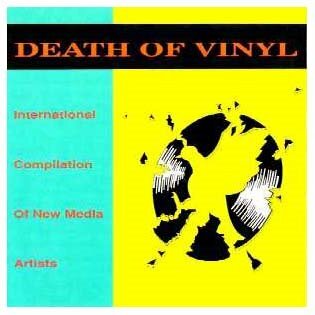 "DOV" stands for "Death of Vinyl" and the record everyone kept telling me to find was their Death of Vinyl compilation, which featured tracks by the likes of Steinski and The Tape-beatles. For awhile, this was one of the only places a person could find The Motorcade Sped On by Steinski and Mass Media. I suppose it's probably still hard to find though, isn't it? I got ahold of Gerald Belanger (1/2 of Nubile G and The Spurious Whiz) at some point a long time ago, who sent me a CDR of the release (which had by then sold out), with an original copy of the album art, and I felt like I had struck gold. I recently did an online search for the release and found one of the artists included on the compilation had a few copies left and was selling them at the band's website. So, about ten years later, I finally got an original copy. Folks who have tuned in regularly over the years will recognize Nubile G and The Spurious Whiz as the artists behind Your Jolly Giant, one of a handful of tracks which have been played more than twice on the show (A recent investigation reveals that only a couple dozen of the thousands of collages in the SAR library have been played more than 3 times each and only four have been played as many as 5 times apiece. This is pretty amazing, if I do say so myself, especially considering how small the library was that first year). Your Jolly Giant is the opening track on the Death of Vinyl compilation. When interviewing Charles Watson (the other 1/2 of Nubile G and the Spurious Whiz), for an upcoming feature on the label, I made a successful plea for new material and eventually found a disc with three new tracks by the group in my mailbox. "New" to me, that is. The group disbanded around 1992. Read on for a very insightful Q&A with Charles Watson of Nubile G and the Spurious Whiz. He tells us all about not only the band, but also about running the DOVentertainment label with Gerald Belanger in Toronto, Ontario, from '89-'92. Without further ado, here's the SAR Q&A with Charles Watson of Nubile G and the Spurious Whiz! *Are there any additional names used to describe this project: Our name was initially meant to be a piss-take on acts with names like "Jazzy Jeff & The Fresh Prince" and "Rob Base & DJ EZ Rock", But those acts were falling out of favour by the late 1980's. The "short name" of the band was "G-Whiz". We used this name colloquially when discussing the band in private, but eventually we released a song called "America Is A Paper Tiger" under that name. Some of the DJ's didn't like the political nature of that track, and that ended up being the last thing we did as a group. Later, some of us recorded under the name "Virex,” which was an ambient project. *Do you use a pseudonym? "The Spurious Whiz" was my pseudonym for the purposes of this project. "Nubile G" was actually Gerald Belanger, the proprietor of DOVe Records, now affiliated with Nice & Smooth, here in Toronto. At that time, we were the only two people working at DOVe. G-Whiz was our in-house band. We were heavily influenced by The Residents, who ran Ralph Records, anonymously. We wanted to do something similar; run a record label, and release our own material, without explicitly letting anyone know that it was actually us. *Members: There were 2 members, although we welcomed contributions from Danté, Dave Newfeld (AKA Producers For "Bob"), Heiki Sillaste from Digital Poodle, Jean-Claude Cutz of DIN, and possibly others. These are some pretty hazy memories now. *Founding Members: Charles G. Watson & Gerald Belanger. *Tape manipulations, digital deconstructions or turntable creations: I'd say "digital deconstructions" would be the best description, as we used samplers heavily. Not a lot of tape was used when producing any G-Whiz material. My main instrument at the time was a Roland W-30. We also used a Casio FZ1, and a plethora of other synths. Once we got our hands on a Roland 909 for one project. It think that was borrowed from Dave Rout, then of Bang Electronica. *Another genre descriptor: We didn't create a genre-name for our limited musical output. We were heavily influenced by the likes of Negativland, but we wanted to make something more accessible. It seemed feasible at the time that we could score a groundbreaking "hit". There was a slick commercial radio station called CFNY here in Toronto, and they played some of our stuff, as well as lots of other bizarre, local material. Things seemed to be changing for the better back in those days. Those days were short-lived, though. CFNY soon became "The Edge" and is now fully formatted. Many of the ideas for the songs came from Gerald, who had more of a background with tape manipulation. I had more of a traditional musical background, and had been trying to apply some of that tape-manipulation-style material to a more solid beat. We thought that we could conceivably break through on commercial radio, and still stay true to our experimental roots. Of course, sometimes the experimental aspect took over. And, it is the more experimental stuff that people remember the most. *Is there a story behind your name? Gerald came up with the name "Nubile G" as a rather accurate descriptor for himself at the time. I'll let people decide for themselves what they think "The Spurious Whiz" might be a reference to. We were young men with one-track minds, and thankfully, a sense of humour. *Location: Our press releases at the time indicated that we were actually from space. We had our graphic designer design a UFO. There were also comic strips drawn in which Nubile G. & The Spurious Whiz confront a mutated version of The New Kids On the Block as they invade Toronto. But, Nubile G. & The Spurious Whiz are concealed safely within their UFO, and their faces are never revealed. In actuality, we both grew up in and around Toronto and it's surrounding suburbs. *What is your creative/artistic background: I was in a rock band as a teen-ager in the 1980's. When that little fantasy subsided, I joined a band called "The Impaled" which later changed it's name to "Capital i". We were a trio, and we hung our instruments off of a large scaffolding structure. There were keyboards, drums, drum pads, cymbals, and various other noise-making things dangling off of this thing. "Capital i" attracted a small following around Toronto, but eventually disbanded when I moved away to college, where I started spending time with Gerald Belanger, who ran the radio station at the college. When we left college, DOVe was born. And, we wanted to release some of our own material anonymously on our burgeoning new label. *History: We worked together between 1989 and 1992, or so. Because we were also running DOVe, G-Whiz was not always a priority. We had been selling lots of Digital Poodle and Zoviet France CD's, and we spent alot of time running around Toronto, responding to mail orders, and heaving lots of shipments to the post office. Occasionally, we'd take trips to Montréal to convince shops there to consign our stuff. For better or for worse, Nubile G. And The Spurious Whiz took a back seat to all of this work. It was an exciting time. *Born: I was born in Toronto. I think Gerald was born in Québec, but I can't remember. *Motivations: At the time, we were interested in making and releasing some innovative music for the DOVe. We were very interested in selling music, and becoming hugely successful. It didn't work, really. But "Your Jolly Giant" did manage to make #1 in the former Yugoslavia, right before the entire country disintegrated. We're still not sure about whether that song actually caused the collapse of Yugoslavia, but I'm sure it had at least some influence. When a song like that goes to #1, then you'd better start running for shelter. Civil war is imminent. Expect a province or two to break away and transform themselves into independent states. Also: it's futile to try and recover royalties from countries that don't exist anymore. Don't try. *Philosophy: We wanted our music to be described as "entertainment". We wanted it to be innovative, funny, shocking, and dancable. I don't think we wanted it to be "philosophical", although perhaps it was inadvertently. Some of our later material took on a bit of a political bent. *How would you like to be remembered: I hope that people can see the humour in it. When we were recording the stuff, we were typically laughing hysterically. After our first attempt to record "Your Jolly Giant", we left the studio, and listened to it in the car. We were exhausted, and ended up laughing so hard we cried. We loved the sample of Arnold Schwartzenegger saying "And now your body is ready for the major pump!" *Web address: The web didn't really exist when we disbanded, so we don't really have one.